The life of Siddhartha Gautama, the person we call the Buddha, is shrouded in legend and myth. Although most historians believe there was such a person, we know very little about the actual historical person. The "standard" biography, relayed in this article, appears to have evolved over time. It was largely completed by the "Buddhacarita," an epic poem written by Aśvaghoṣa in the second century A.D.
His father, King Suddhodana, was the leader of a large clan called the Shakya (or Sakya). It's not clear from the earliest texts whether he was a hereditary king or more of a tribal chief. It is also possible that he was elected to this status. Suddhodana married two sisters, Maya and Pajapati Gotami. They are said to have been princesses of another clan, the Koliya, from what is northern India today. Maya was the mother of Siddhartha, and he was her only child. She died shortly after his birth. Pajapati, who later became the first Buddhist nun, raised Siddhartha as her own. By all accounts, Prince Siddhartha and his family were of the Kshatriya caste of warriors and nobles. Among Siddhartha's more well-known relatives was his cousin Ananda, the son of his father's brother. Ananda would later become the Buddha's disciple and personal attendant. He would have been considerably younger than Siddhartha, however, and they didn't know each other as children. When Prince Siddhartha was a few days old, it is said, a holy man prophesied over the prince. By some accounts, nine Brahman holy men made the prophecy. It was foretold that the boy would be either a great ruler or a great spiritual teacher. King Suddhodana preferred the first outcome and prepared his son accordingly. He raised the boy in great luxury and shielded him from knowledge of religion and human suffering. At the age of 16, he was married to his cousin, Yasodhara, who was also 16. This was no doubt a marriage arranged by the families, as was customary at the time. Yasodhara was the daughter of a Koliya chief, and her mother was a sister to King Suddhodana. She was also a sister of Devadatta, who became a disciple of the Buddha and then, by some accounts, a dangerous rival. The prince reached the age of 29 with little experience of the world outside the walls of his opulent palaces. He was oblivious to the realities of sickness, old age, and death. One day, overcome with curiosity, Prince Siddhartha asked a charioteer to take him on a series of rides through the countryside. On these journeys he was shocked by the sight of an aged man, then a sick man, and then a corpse. The stark realities of old age, disease, and death seized and sickened the prince. Finally, he saw a wandering ascetic. The charioteer explained that the ascetic was one who had renounced the world and sought release from the fear of death and suffering. These life-changing encounters would become known in Buddhism as the Four Passing Sights. For a time the prince returned to palace life, but he took no pleasure in it. Even the news that his wife Yasodhara had given birth to a son did not please him. The child was called Rahula, which means "fetter." One night the prince wandered the palace alone. The luxuries that had once pleased him now seemed grotesque. Musicians and dancing girls had fallen asleep and were sprawled about, snoring and sputtering. Prince Siddhartha reflected on the old age, disease, and death that would overtake them all and turn their bodies to dust. He realized then that he could no longer be content living the life of a prince. That very night he left the palace, shaved his head, and changed from his royal clothes into a beggar's robe. Renouncing all the luxury he had known, he began his quest for enlightenment. Siddhartha started by seeking out renowned teachers. They taught him about the many religious philosophies of his day as well as how to meditate. After he had learned all they had to teach, his doubts and questions remained. He and five disciples left to find enlightenment by themselves. The six companions attempted to find release from suffering through physical discipline: enduring pain, holding their breath, and fasting nearly to starvation. Yet Siddhartha was still unsatisfied. It occurred to him that in renouncing pleasure he had grasped the opposite of pleasure, which was pain and self-mortification. Now Siddhartha considered a Middle Way between those two extremes. He remembered an experience from his childhood when his mind had settled into a state of deep peace. He saw that the path of liberation was through the discipline of mind, and he realized that, instead of starvation, he needed nourishment to build up his strength for the effort. When he accepted a bowl of rice milk from a young girl, his companions assumed he had given up the quest, and they abandoned him. Siddhartha sat beneath a sacred fig tree (Ficus religiosa), known ever after as the Bodhi Tree (bodhi means "awakened"). It was there that he settled into meditation. The struggle within Siddhartha's mind came to be mythologized as a great battle with Mara. The demon's name means "destruction" and represents the passions that snare and delude us. Mara brought vast armies of monsters to attack Siddhartha, who sat still and untouched. Mara's most beautiful daughter tried to seduce Siddhartha, but this effort also failed. Finally, Mara claimed that the seat of enlightenment rightfully belonged to him. Mara's spiritual accomplishments were greater than Siddhartha's, the demon said. Mara's monstrous soldiers cried out together, "I am his witness!" Mara challenged Siddhartha, "Who will speak for you?" Then Siddhartha reached out his right hand to touch the earth, and the earth itself roared, "I bear you witness!" Mara disappeared. As the morning star rose in the sky, Siddhartha Gautama realized enlightenment and became a buddha, which is defined as "a person who has achieved full enlightenment." At first, the Buddha was reluctant to teach because what he had realized could not be communicated in words. Only through discipline and clarity of mind would delusions fall away and could one experience the Great Reality. Listeners without that direct experience would be stuck in conceptualizations and would surely misunderstand everything he said. Still, compassion persuaded him to make the attempt to transmit what he had realized. After his enlightenment, he went to the Deer Park in Isipatana, located in what is now the province of Uttar Pradesh, India. There he found the five companions who had abandoned him and preached his first sermon to them. This sermon has been preserved as the Dhammacakkappavattana Sutta and centers on the Four Noble Truths. Instead of teaching doctrines about enlightenment, the Buddha chose to prescribe a path of practice through which people can realize enlightenment for themselves. 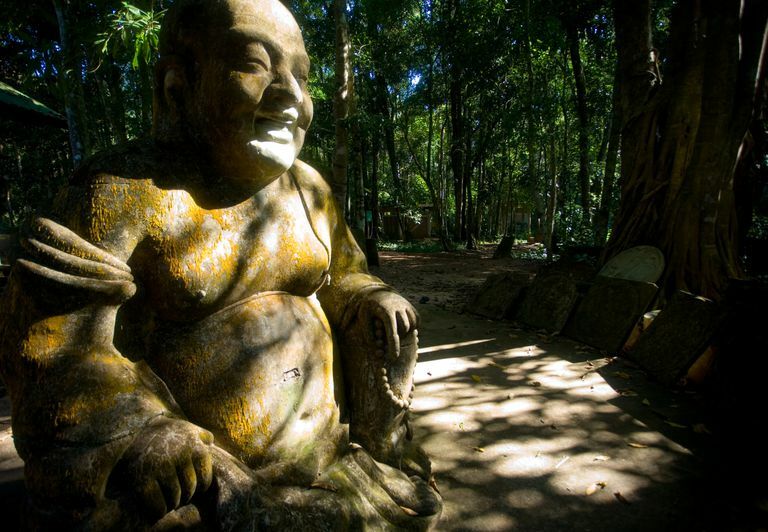 The Buddha devoted himself to teaching and attracted hundreds of followers. Eventually, he became reconciled with his father, King Suddhodana. His wife, the devoted Yasodhara, became a nun and disciple. Rahula, his son, became a novice monk at the age of seven and spent the rest of his life with his father. The Buddha traveled tirelessly through all areas of northern India and Nepal. He taught a diverse group of followers, all of whom were seeking the truth he had to offer. At the age of 80, the Buddha entered Parinirvana, leaving his physical body behind. In his passing, he abandoned the endless cycle of death and rebirth. "Behold, O monks, this is my last advice to you. All compounded things in the world are changeable. They are not lasting. Work hard to gain your own salvation." The Buddha's body was cremated. His remains were placed in stupas—domed structures common in Buddhism—in many places, including China, Myanmar, and Sri Lanka. Some 2,500 years later, the Buddha's teachings remain significant for many people throughout the world. Buddhism continues to attract new followers and is one of the fastest-growing religions, though many do not refer to it as a religion but as a spiritual path or a philosophy. An estimated 350 to 550 million people practice Buddhism today.